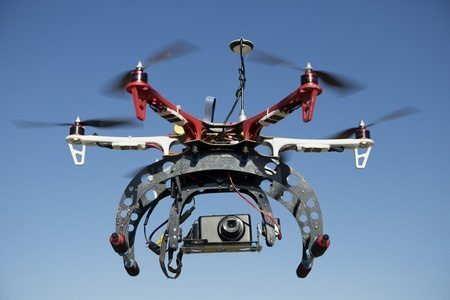 Drones, commonly known as unmanned aerial vehicles (UAV) or unmanned aircraft systems (UAS), are the subject of a rapidly increasing number of patents within the U.S. Patent and Trademark Office (USPTO). These patents are directed to subject matter, such as the manufacturing of drones and drone components (e.g. U.S. 9,242,571); the use of drones for delivery (e.g. U.S. 9,244,147); the use of drones for agriculture (U.S. 8,731,836); the use of drones for inspection/surveillance (U.S. 9,242,728); and the use of drones for aerial refueling (U.S. 9,227,735). Consequently, there are several ways to pursue patent protection for a drone-related invention. Some examples include protecting a drone apparatus comprising specific hardware components; a method/process for using a drone to perform various applications; and/or a drone system involving the interaction of specific hardware and/or software components. In addition, the aesthetic appearance of the drone (or its various components) may be eligible for patent protection via a design patent. Prior to deciding the type of patent application to file or the subject matter to be included in the patent application, it is very important to identify the novel aspects of the drone invention. As more patent applications continue to be filed daily in this industry, there is a growing number of potential prior art references to be considered. Thus, it is critical to work with a patent attorney that can develop and implement a customized patent strategy for you based on your commercial and patent goals surrounding your drone invention.